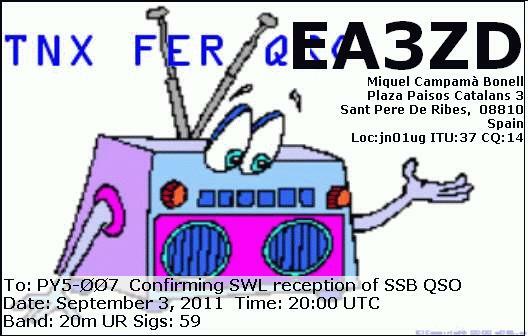 eQSL recebido: PD1ICF, Haaksbergen Ov, The Netherlands, 14 MHz, QSO with PY6RT. 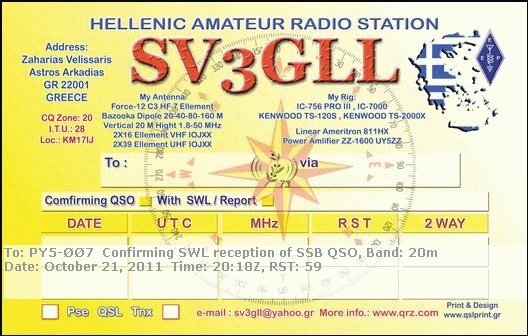 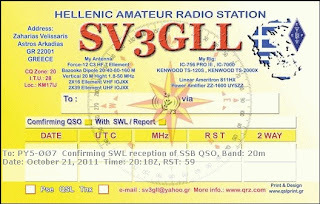 eQSL recebido: SV3GLL, Astros Arkadias, Greece, 14 MHz, QSO w/ PY6RT. 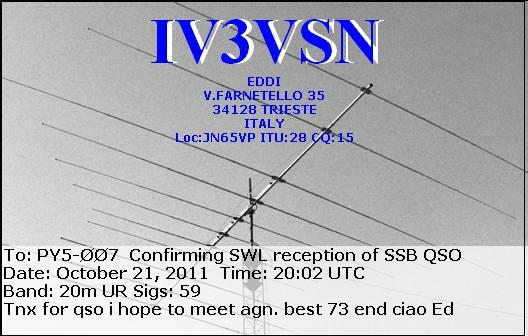 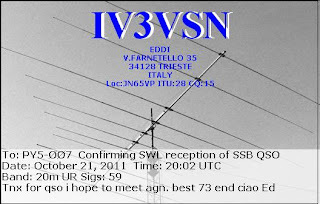 eQSL recebido: IV3VSN, Trieste, Italy, 14 MHz, QSO w/ PY6RT. 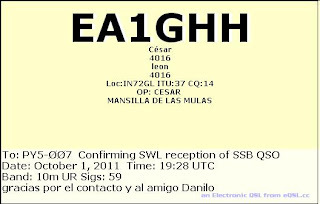 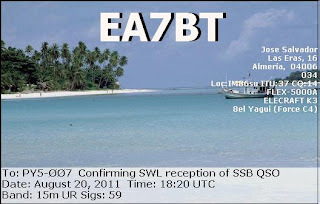 eQSL recebido: EA7BT, Almería, Spain, 21 MHz, QSO w/ CW5Z. 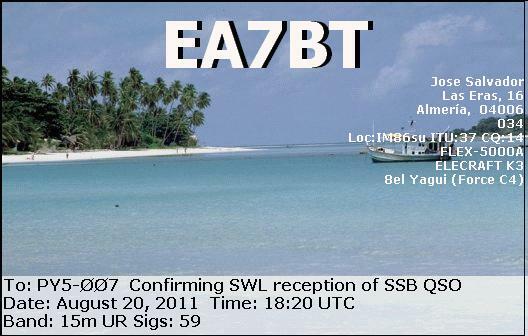 eQSL recebido: EA7BT, Almería, Spain, 21 MHz, QSO w/ OH6RM. 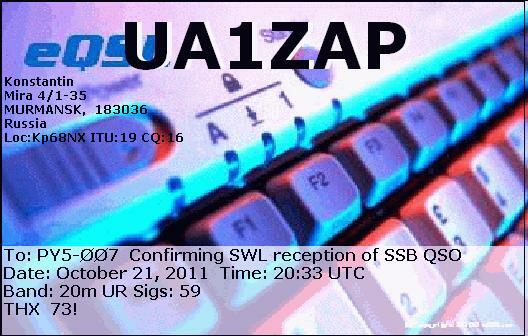 eQSL recebido: UA1ZAP, Murmansk, Russia, 14 MHz, QSO w/ PY6RT. 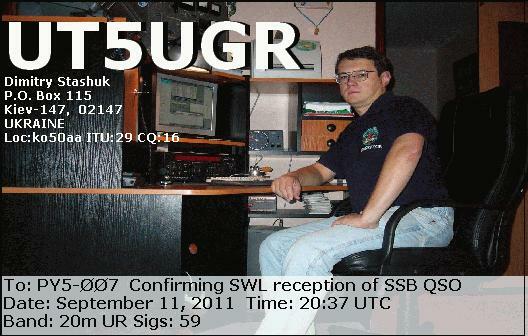 eQSL recebido: UT5UGR, Kiev, Ukraine, 14 MHz, QSO w/ AY5F (Contest WEA). 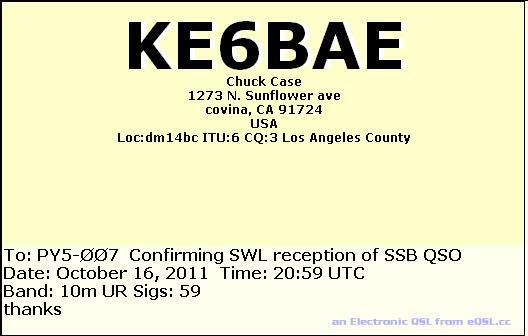 eQSL recebido: KE6BAE, Covina, CA, United States, 28 MHz, QSO w/ LW6DG. 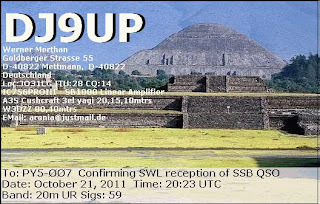 eQSL recebido: DJ9UP, Mettnann, Germany, 14 MHz, QSO w/ PY6RT. 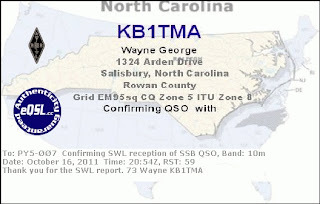 eQSL recebido: KB1TMA, Salisbury, North Carolina, United States, 28 MHz, QSO w/ LW6DG. 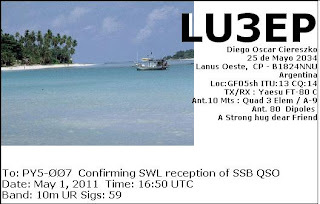 eQSL recebido: LU3EP, Lanús Oeste, República Argentina, 28 Mhz, QSO w/ EA8DD, RM5D, PY2MM. 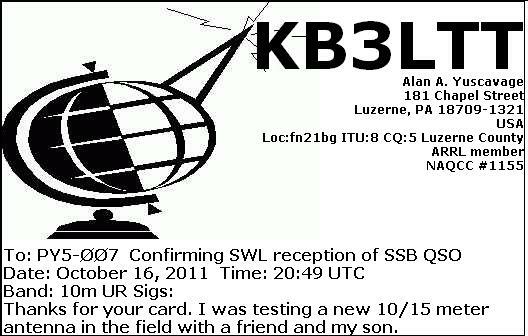 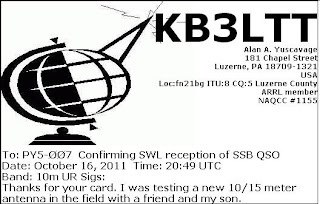 eQSL recebido: KB3LTT, Luzerne, PA, United States, 28 MHz, QSO w/ LW6DG. 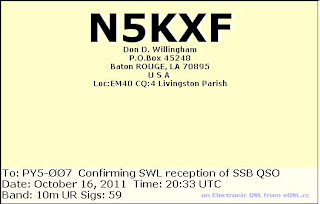 eQSL recebido: N5KXF, Baton Rouge, LA, United States, 28 MHz, QSO w/ LW6DG. 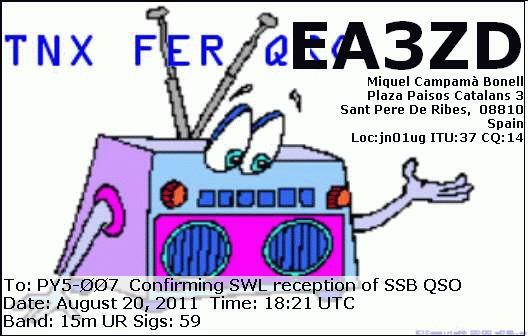 eQSL recebido: EA3ZD, Sant Pere de Ribes, Spain, 14 MHz, QSO w/ PY6RT. 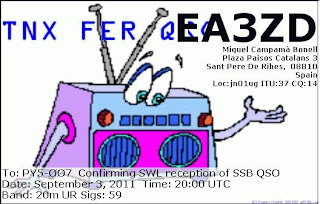 eQSL recebido: EA3ZD, Sant Pere de Ribes, Spain, 21 MHz, QSO w/ CW5Z. 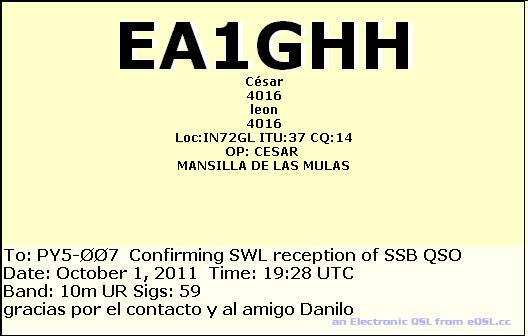 eQSL recebido: EA1GHH, Mansilla de las Mulas, Spain, 28 MHz, QSO w/ CE4SES. 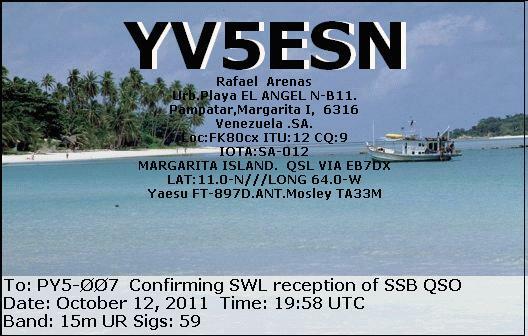 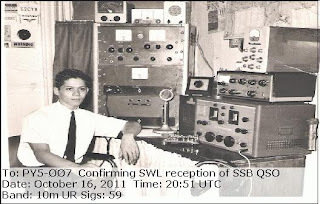 eQSL recebido: YV5ESN, Pampatar, Margarita Island, Venezuela, 21 MHz, QSO w/ CN8ZG. 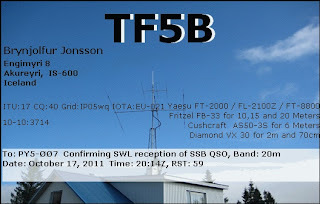 eQSL recebido: TF5B, Akureyri, Iceland, 14 MHz, QSO w/ EA2GFJ. 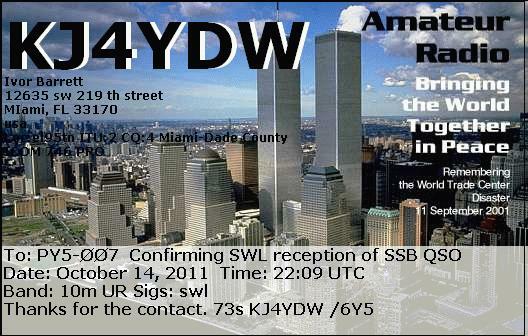 eQSL recebido: KJ4YDW, Miami, FL, United States, 28 MHz, JH1AJT. 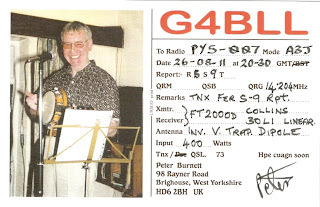 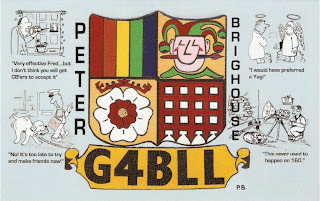 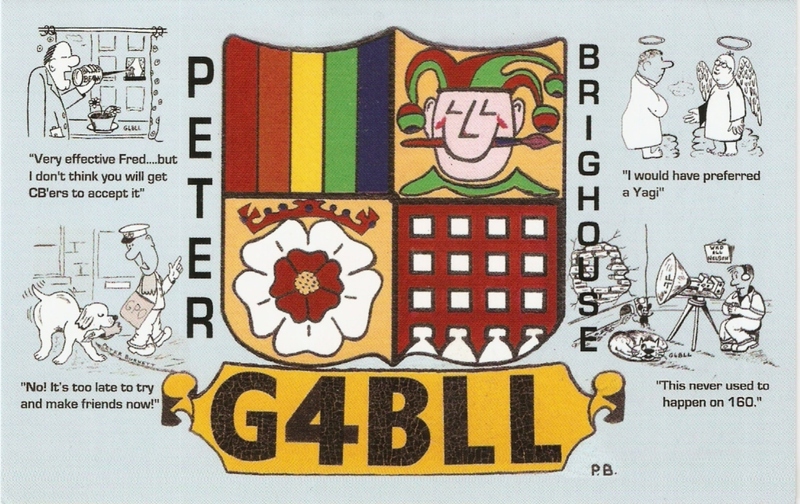 QSL recebido: G4BLL, Brighouse, England, 14 MHz, QSO w/ PY6RT. 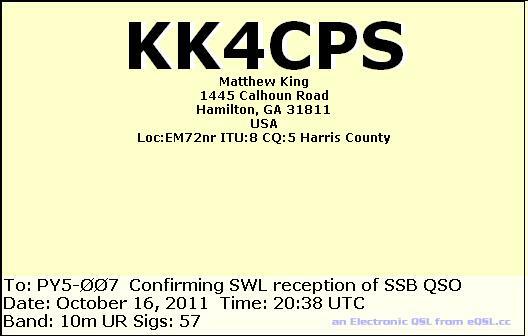 eQSL recebido: KK4CPS, Hamilton, GA, United States, 28 MHz, QSO w/ LW6DG. 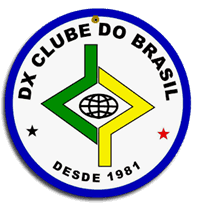 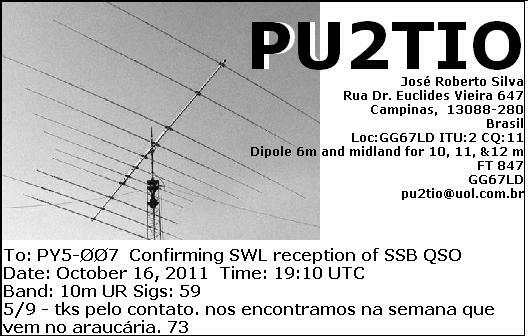 eQSL recebido: PY2LOW, Osasco, SP, Brasil, 28 MHz, QSO w/ KC4TVZ. 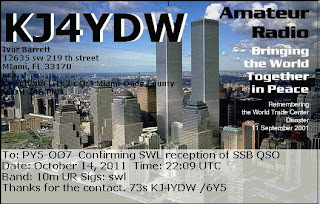 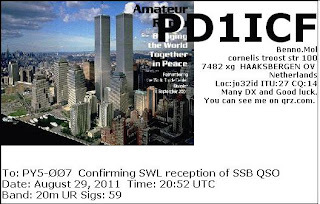 eQSL recebido: W2AAS, New City, NY, United States, 28 MHz, QSO w/ LW6DG. 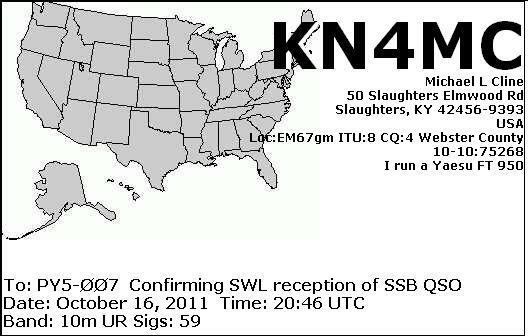 eQSL recebido: KN4MC, Slaughters, KY, United States, 28 MHz, QSO w/ LW6DG. 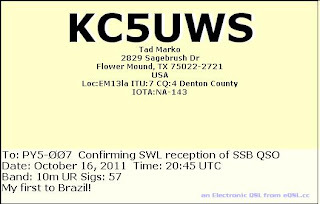 eQSL recebido: KC5UWS, Flower Mound, TX, United States, 28 MHz, QSO w/ LW6DG. 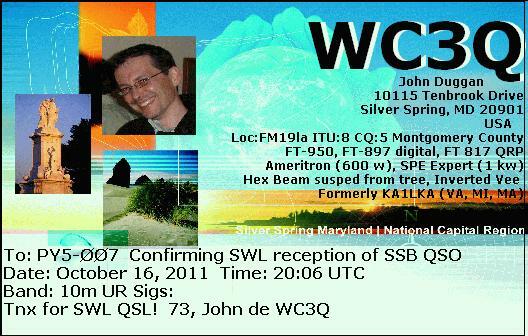 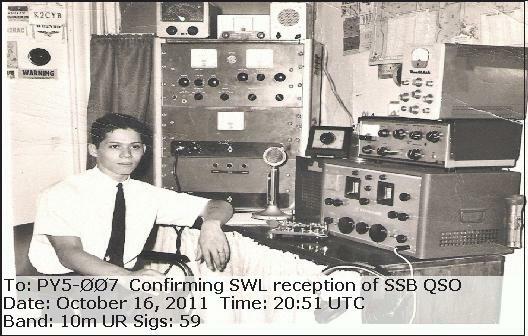 eQSL recebido: WC3Q, Silver Spring, MD, United States, 28 MHz, QSO w/ LW6DG. 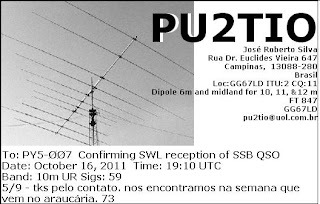 eQSL recebido: PU2TIO, Campinas, SP, Brasil, 28 MHz, QSO w/ XQ7HL. 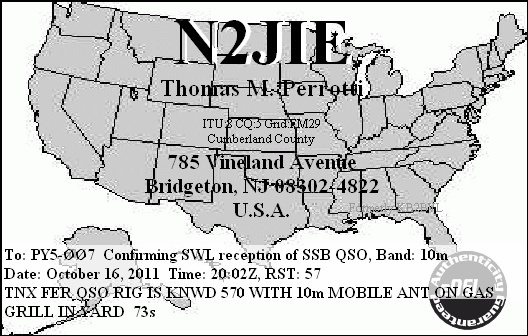 eQSL recebido: N2JIE, Bridgeton, NJ, United States, 28 MHz, QSO w/ LW6DG. 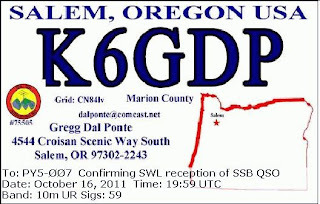 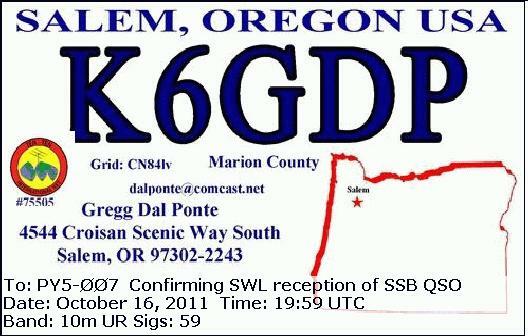 eQSL recebido: K6GDP, Salem, OR, United States, 28 MHz, QSO w/ LW6DG. 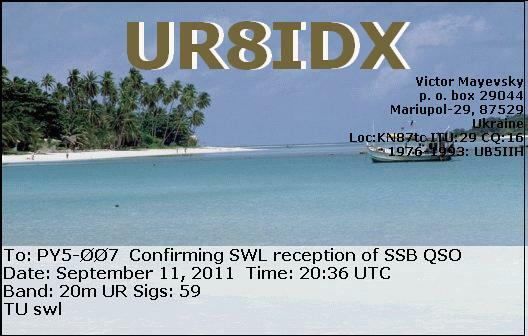 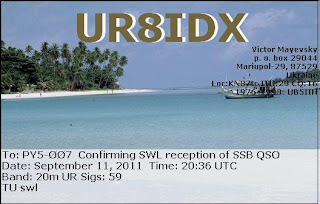 eQSL recebido: UR8IDX, Mariupol, Ukraine, 14 MHz, QSO w/ AY5F (contest WAE). 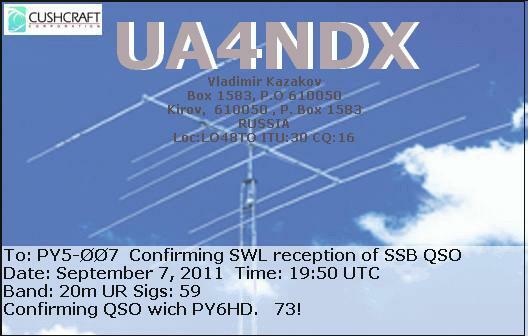 eQSL recebido: UA4NDX, Kirov, Rússia, 14 MHz, QSO w/ PY6HD. 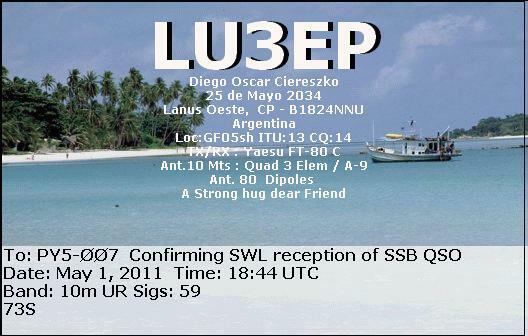 eQSL recebido: LU3EP, Lanús Oeste, CP, República Argentina, 28 MHz, QSO w/ IK6CWQ, PY1ZV, LU9CF, PY1NB, LU1FVE, etc.